I was never much of a console gamer. An arcade denizen, sure. But the first console the graced the Tarver household was a Nintendo 64, contraband smuggled in by my younger brother and played furtively in the precious hours of parental absence until we were found out. Fast forward several years. It was the summer before senior year of college, my summer job on campus netted me more money than I've ever made at one time, and in true nouveau riche fashion, I splurged on what was then a next-gen game system. Because of that 64 - most specifically, The WWF/E games Wrestlemania 2000 and No Mercy - I stuck with Nintendo as a platform, hoping THQ and AKI would recreate that magic on GameCube. They didn't. A couple of weeks ago, while sidelined from doing much else, I hopped back on the GameCube, which is hooked up to a small LCD TV that doubles as my laptop's second screen. I popped in NBA Street Vol. 2 and instantly got reacquainted with an old friend. The NBA Street franchise is the second series to begin under the EA Sports BIG label, and the first focused on a "Big Four" sport. 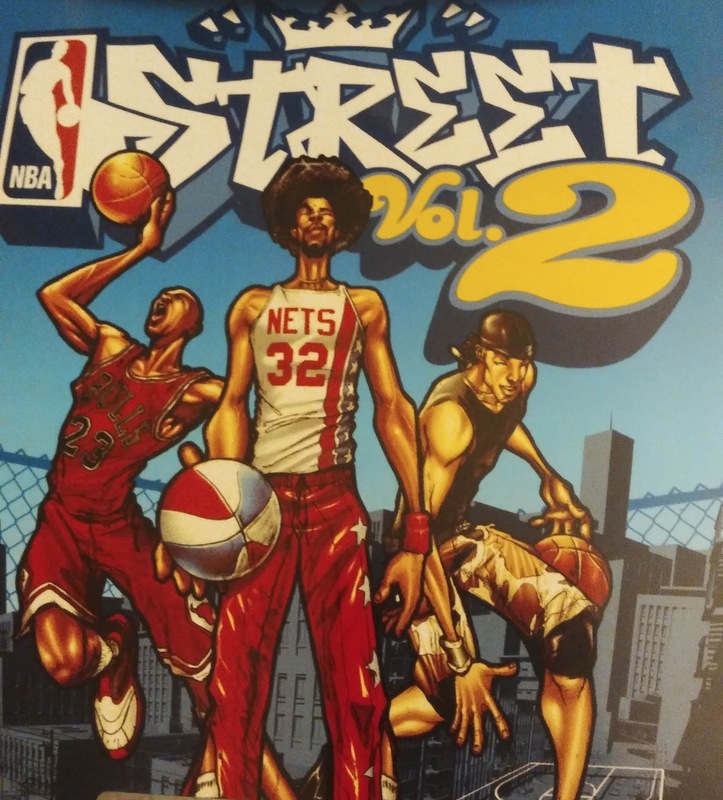 The series used its NBA license to put familiar faces into a streetball context, pitting 3 on 3 teams against one another in game that defaulted to 21. The games debuted at the height of the NBA's hip hop era, a time when the league's image was virtually and controversially indistinguishable from the rap music of the day. Objectively and subjectively, Allen Iverson was one of the faces of the league, advancing to the NBA Finals on a 76ers team that literally had a mascot named Hip Hop. Elsewhere in the sports/entertainment world, the And1 Mixtape Tour was putting a 21st century spin on the Harlem Globetrotters, and the WWF/E was in the transition from the Attitude Era to the rise of John Cena. Volume 2 tends to be my go-to of the series, living in the sweet spot of the franchise's advancements and fun, exciting, but relatively easy gameplay. The players in the Street series play above the rim - cartoonishly so, in fact - with exciting gravity-defying dunks, otherworldly handles, and fast gameplay. In true streetball fashion standard games are to 21 (win by two). Volume 1 set the foundation and earned the series the clout that allowed Volume 2 to level up. A generic hip hop soundtrack was replaced by licensed music, and playground color commentary was replaced by legendary hip hop host Bobbito Garcia. Of the latter, Bobbito laid down a vocal track so prolific, you could get several games in and swear he was still freestyling. Like in its predecessor, tricks and combos would charge a meter towards a gamebreaker, a nearly unstoppable shot or dunk that results in bonus points, and subtracts from your opponent. Only Volume 2 featured the second-level gamebreaker, executed through a cutscene that involves the whole team. A decade and a half ago, the game begat battles with friends and family in what was for me the waning days of college. A GQ piece dubbed it the greatest basketball video game of all time, and I can't say I disagree. Not that I didn't love the third installment as well. If Vol. 2 reminisced on the childhood playground days (and indeed, its main theme was Pete Rock and CL Smooth's They Reminisce Over You), NBA Street V3 was the basketball court as high art. Common's voice waxed poetic on homecourts through the US, Canada, and the UK; Kanye's The College Dropout had dropped the year before, Def Poetry Jam was airing on HBO, and hip hop's conscious phase served as a foil to the crunk era, also in full swing. Here, the dunkers were artists, affixing authentic signatures to above the rim Rembrandts. Bobbito's voice talent returned, and the game was more customizable than ever - you could create whole courts (I've made one for every city, state, or metro I've ever lived in), or send your created ballers to the barber shop or get their kick game right. V3 also added a dunk contest, and gave players the opportunity to control the action during gamebreakers. The series would advance once more, to NBA Street Homecourt, but by then it had left and platform I had - the same inertia that got me a Gamecube years before stuck me with a Wii in the generation where Homecourt debuted on PS3 and XBox 360. Still, I'm led to believe that the series had already peaked and already had the best it had to offer.